1988 - Michael perform 6th of 9 dates at Tokyo Dome in Tokyo during the Japanese leg of Bad tour. 1992 - Michael perform 4th of 8 dates at Tokyo Dome in Tokyo during the Japanese leg of Dangerous tour attending 45,000 fans. 1996 - "Ghosts" premièred in Sony Movie Theatre in Tokyo, Japan. Michael was present at the Tokyo première of his 35-minute short film. As part of the grand finale, all performers lined up across the stage and the orchestra started The Jacksons' hit "Shake Your Body [Down To The Ground]". Michael came out from the wings to wild applause and cheering. Unfortunately, for the crowd, he didn't perform, telling the audience that he had laryngitis, but he did wish everyone happy holidays. 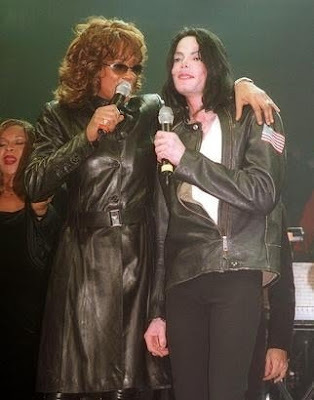 Surprise presenter Whitney Houston jumped up and down and hugged Michael. Before he left the stage, he promised the packed house, "The best is yet to come!" The Charity concert feat. performances by Whitney Houston, Marc Anthony, Destiny's Child, Ricky Martin, Christina Aguilera, Brian McKnight, Melanie C, 98 Degrees, Lara Fabian, Gloria Gaynor, Deniece Williams, Jon Secada...Toni Braxton served as emcee for the event. This entry was posted on 19 December 2010 at Sunday, December 19, 2010 and is filed under 1988, 1992, 1996, 2000 . You can follow any responses to this entry through the comments feed .